Restoril is a sedative-hypnotic benzodiazepine, most commonly used to treat insomnia. Just like any other benzos, it is an addictive substance. Therefore, you should not use it longer than ten days. Besides its highly addictive properties, this drug can have many side effects. This is why you should only take it when doctor-prescribed. What are the Minor Side Effects of Restoril? Your doctor should be aware of the potential side effects of this medicine. In any case, it is of the essence to inform him about any discomfort you might be experiencing during its usage. What are the Major Restoril Side Effects? This drug may also cause serious side effects that need medical attention. Do you notice any of the following major Restoril side effects? If you do, immediately inform your physician. You are feeling withdrawal symptoms such as insomnia, irritability, etc. In some cases, Restoril addiction may also cause serious health problems. They include low blood pressure and breathing problems. Restoril may interact with other medications. Therefore, make sure to inform your doctor if you are taking other drugs. 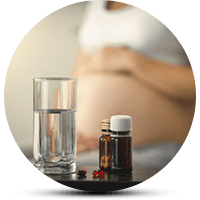 Due to Restoril side effects, the use during pregnancy is strictly forbidden. This is due to its teratogenic effects it might have on the fetus. This means it will disturb the natural development of the fetus. As a result, the baby will come out with some terrible conditions. Furthermore, taking this drug while breastfeeding also highly ill-advised. Sometimes, it may cause an allergic reaction. Therefore, tell your doctor if you are suffering from allergy to benzos or any other medication. You may notice some of these symptoms. They include breathing problems, hives, and swelling. At any rate, if you see them, immediately seek medical help. In addition, since Restoril is a sedative-hypnotic. Therefore, you should not be operating a motor vehicle, or other heavy machinery. Doctors recommend it highly because it makes you very sleepy. Make sure to take the medicine before you go to bed. This way, you can avoid possible accidents and/or incidents at work or home.